Auctions are a unique part of the watch world where you are given the opportunity to look into the private collections of watch collectors and, if you've got the money, take something away. It's also a fantastic opportunity to learn about the history of certain brands and pieces that you wouldn't normally see, which is why I've decided to start looking at auctions around the world and share with you some of my highlights. There aren't any particular requirements that the watches meet, no price bracket I'm going to hold myself to, in fact I may not even like the watch but it has to have something about it that makes me look twice and makes me want to learn more about it. For more information about this auction, please visit Watches of Knightsbridge to view the full catalogue. The Bremont Supermarine Descent Royal Navy Clearance Limited Edition. Photograph Courtesy of Watches of Knightsbridge. This Bremont is the newest piece out of the selection I have chosen but it's most definitely the hardest to buy. When this watch was in production it was only available to current or retired Navy Clearance Divers. These divers are a highly talented group whose main role is to discover mines and other explosives and "remove" them, usually with underwater explosives and needless to say that it's a pretty exclusive club. This version of Bremont's popular Supermarine S500 is highly legible with the contrasting black DLC case coated and large super luminova filled hour markers and hands making it very distinctive from the standard all steel version. For a modern professional divers watch the size of 42mm might seem a tad small, but I've found that Bremonts tend to wear a little larger on the wrist due to their depth. For those that are not aware, Bremont has strong ties to various military squadrons around the world and once you've proven yourself to be a genuine military man or woman they will discuss customizing a batch of watches with your squadron's crest or other similar design. They have a small selection of these dial designs on their website but I highly recommend visiting a boutique if there is one near you as there is a far greater selection. The lot description doesn't say whether this watch ever saw active use or whether the owner was still serving as a diver or retired but nothing makes something more desirable that knowing that you're not supposed to have it. This opportunity to own a incredibly rare watch shouldn't be passed for those interested. The lot estimate is between £2500 - £3500. Jaeger LeCoultre Memovox "Parking meter"
Jaeger LeCoultre Memovox "Parking Meter" . Photograph courtesy of Watches of Knightsbridge. I love the Jaeger LeCoultre Memovox. I absolutely adore it. From the simplistic modern design to the functionality and artistry of a wrist sized alarm I think it's one of the best watches ever made and there are many different variants available. Different dial colours, hour markers, inner wheel designs and case designs used throughout its rich history, whether on a dress piece or on those rare Deep Sea Memovoxes that we're all hoping we'll be the one to find in a thrift shop for $5.99. This particular Memovox (from the latin for remembering "Memor" and voice "vox") circa the 1960s was obviously designed for those city dwellers rather than sea dwellers as the inner dial features marks related to the amount of time left on a car park meter, complete with the ever familiar "P" symbol. Unlike the musical chime of a minute repeater or the contemporary reissue of the Memovox, these older pieces create a flat whirring sound accompanied by a small vibration. The dial on this piece is signed "LeCoultre" rather than the full "Jaeger LeCoultre" indicating that it was originally sold in the United States, with the movement signed LeCoultre as well. The case of this piece is made of 10k filled yellow gold meaning that a thick sheet of gold (thick compared to gold plating) has been placed over a base metal. Despite its age the case has been graded as in mint to excellent condition however it is more susceptible to wear than solid gold pieces. Saying this however according to the description, this piece still has the original crowns which again for a watch this age is very good to see. It has quite a low auction estimate of £500-£700 which I imagine is due to a combination of the slight discolouration of the dial rim from the bottom of 4 o'clock to 10 o'clock and the unique parking meter design. For those who like their watches with that classic sixties look I would definitely keep an eye on this. This auction has a lot of absolutely fantastic Omega Speedmasters available, from current pieces to a great selection of Mark IIs, IIIs, and IVs and even a beautiful 1957 Speedmaster that graces the cover of the catalogue. So why have I chosen this contemporary limited edition barely two years old rather than those? Well it's because that I actually met the seller and the watch a few months ago. The original owner of the watch and Buzz Aldrin. Photograph courtesy of Watches of Switzerland. Whilst working in retail, a gentleman came in and started looking at our Omega selection, so I struck up a conversation with him. 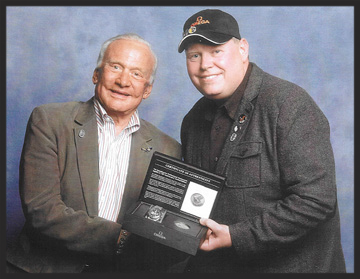 He showed me the watch in question and said it was presented to him by Buzz Aldrin. Now for those who have never worked in retail, you get used to "characters" coming in and spouting fantastical claims (in fact I once was cornered by a man who was convinced he had built a working AI on his computer which spoke to him in the wingdings font in Microsoft Word) and the only polite response is to say "oh how interesting", try to not roll your eyes too much and get away as quickly as possible to make yourself look busy. This man had obviously had this response before and quickly whipped out his iPhone and proceeded to show me various photographs of him at several NASA events culminating with the picture of him being presented this watch by Buzz Aldrin himself. Unfortunately he never went into specifics about why he'd been honoured with this watch but he did say that he was looking to sell it eventually along with a collection of signed NASA memorabilia. Included alongside this watch is a series of signed photos from Commander Vance D. Brand and Mission Specialist Bruce McCandless II (from the tenth NASA Shuttle mission,STS-41-B), a signed photo of Lunar Module Pilot Fred W. Haise from Apollo 13 and several photos of the owner collecting the watch from Buzz Aldrin. This is a very unique opportunity to own several pieces of NASA history plus a beautiful limited edition Speedmaster as well. I think that this particular limited edition with the "Eagle has landed" medallion on the sub seconds dial adds a nice touch of commemorating history without losing the functionality and design that made the Speedmaster so iconic. It's estimated to get £3000 to £4000 but I wouldn't be surprised if it fetches a lot more. A 1962 Rolex Submariner 5512. Photograph Courtesy of Watches of Knightsbridge. Now I'm not a Rolex guy but there is something so appealing about vintage subs. Just like the Speedmaster, the submariners of yesteryear are a brilliant combination of luxury meeting functionality, with these timepieces being some of the most accurate and advanced technology out there. This lot is a perfect example of the fact that condition reports on auctions are very subjective. The dial on this piece has obviously seen some sun and is listed as a "black tropical dial" graded as being in mint to excellent condition. Now some people would see this as dial damage rather than being tropical but it's all down to taste. I think this watch rides the line between the two; on the one hand this truly unique effect has created a beautiful patina across the hands and hour markers with this really interesting tropical circle appearing on the inner part of the dial, making this piece a one off. However, on the other hand I wouldn't mark it's condition as mint.To me mint means "how it left the factory" and this piece has definitely seen some use in the last fifty three years. A few years back, Hodinkee profiled another vintage Rolex, another 5512 but with a crazy spider web/tiger pattern across the dial. Both examples of these watches are far from the original condition with that piece being more visually striking but some might find the more rugged aging of this watch more compelling, as it lends itself to the creation of a miriad of potential stories about the owners throughout the years. This lot is estimated to fetch between £10000 to £14000. A 14ct gold Cartier Pencil with watch. Photograph Courtesy of Watches of Knightsbridge. Now I just think that this piece is a fantastic example of a redundant luxury, a solid 14ct Yellow Gold Pencil which has a Cartier signed watch at the top. Can you imagine how uncomfortable this would be to hold in your hand? However if you were rich enough to own this in the 1920s you probably were rich enough to pay someone to do your writing for you. It might be a shock to learn that not every auction has multi-million dollar lot being sold every minute. Watches of Knightsbridge released a video showing what it's like to be at a normal auction with lots ranging from $500 to over $100,000. At the most recent Watches of Knightsbridge auction, my picks performed quite well with a few surprise performances thrown in the mix. Not that Lange & Sohne though, that selling was a certainity.